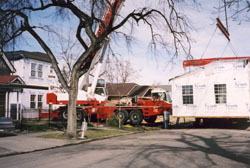 House is lifted off delivery trailer and craned onto foundation. 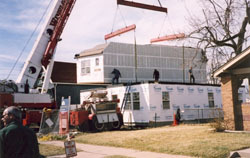 and set on the first floor module. 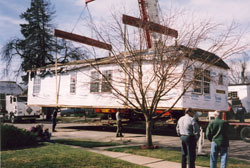 Set crew guides the module onto the home. 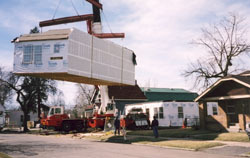 The last module is about ready to be set permanently. 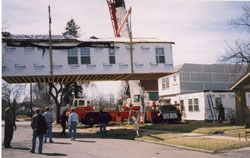 2) The Set Crew attaches straps between the first and second floor. 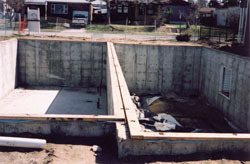 3) by the end of the day the set crew has finished attaching the home to the foundation. 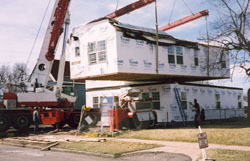 Your Home is ready to move in. 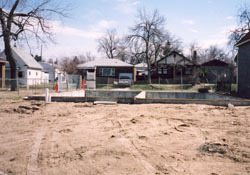 Plumbing - Water, Sewer , Hotwater Heater are installed. 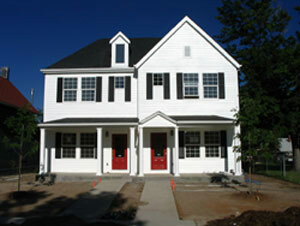 Landscaping , Grass , Fencing is installed.